EU REGULATION 2016/679 OF THE EUROPEAN PARLIAMENT AND OF THE COUNCIL of 14 April 2016 on the protection of natural persons with regard to the processing of personal data and on the free movement of such data, and repealing Directive 95/46/EC (General Data Protection Regulation). 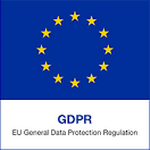 GDPR affects all EU bodies; companies and organizations, private, public and state controlled that maintain and manage private data of EU citizens. In this sense companies and organizations outside EU that manage personal data of EU citizens are also affected. Any information related to a natural person or “Data Subject” that can be used to directly or indirectly identify the person is considered personal data. This information can be anything from a name, a photo, an email address, bank details, posts on social networking websites, medical information, or a computer IP address. After May 25th, 2018 bodies, companies and organizations operating within the EU should use high-tech security systems for the protection of the personal data they manage. Also companies outside EU that manage personal data of EU citizens should also comply by using high-tech security systems for protecting personal data. Which are the penalties for violations? In case of private data protection breach, companies (a) they must inform immediately their National Authority of Personal Data Protection and their National Regulating Authority and (b) will face fines of up to 4% of their annual turnover or 20 million Euro (whichever is greater). Follow the basic data protection principles. Transfer personal data to non-EU countries only under certain conditions. demonstrate their compliance with GDPR. to manage their personal data. Notify and inform the individuals appropriately and promptly about their rights on personal data protection and management. Ensure personal data protection throughout their life cycle. the individuals with direct communication and public announcements. Be able to prove that they comply with all GDPR requirements.